How many M30 convertibles were there? This question always follows the question/speculation about how many M30s were made in general. There hasn’t been much solid information behind it. But there are clues. 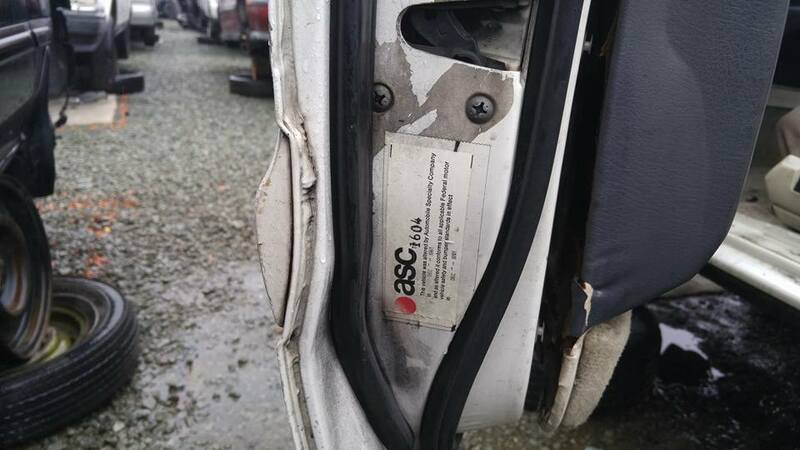 Maybe the ASC sticker located in the driver’s side door yields a clue? There is a stamped number on the sticker. I also found this article on a website called coachbuilt.com. The article talked about ASC and there was a number given to the M30. The following year ASC was awarded a contract to convert the Infiniti M30 Coupe into a convertible. From 1991-1992 an estimated 2500 M30 convertibles were built by ASC at their Rancho Dominguez, (Long Beach) California assembly plant. While I do believe this article is credible, the issue I have is that I am unsure if the website got the estimated number from somewhere else online. I say this because it was always myth that 5000 M30s were made and 2500 made convertible. That false statement has been out there for the last 11 years. 私はcoachbuilt.comというウェブサイトでこの記事を見つけました。この記事ではASCについて語り、M30に与えられた番号がありました。 翌年、ASCはインフィニティM30クーペをコンバーチブルに変換する契約を結んだ。 1991年から1992年にかけて、推定2500 M30のコンバーチブルがASCによって彼らのRancho Dominguez（ロングビーチ）カリフォルニア組立工場に建設された。 この記事はこちらをご覧くださいhttp://www.coachbuilt.com/bui/a/asc/asc.htm 私はこの記事が信じられていると信じていますが、私が持っている問題は、ウェブサイトがオンラインのどこか他の場所から推定された番号を持っているかどうかわかりません。 5000のM30が作られ、2500がコンバーチブルになるというのは常に神話だったので、私はこれを言う。その虚偽の陳述は、過去11年間にそこにありました. The M30 convertible is a fairly scarce car. Only about 3,000 were sold during 1991 and ’92, the only two years it was offered. But the M30 ragtop has held its value, and it may be one of the few Japanese cars that achieves collectible status. Recently a member, Alan M; on the M30 FB page supplied an email that he received in 2002 on how many 1992 M30 convertibles were made. There were 3,112, 1992 Infiniti M30 convertibles, manufactured. This was undeniable as it came from Nissan, rather than hearsay or speculation as many have always went on. 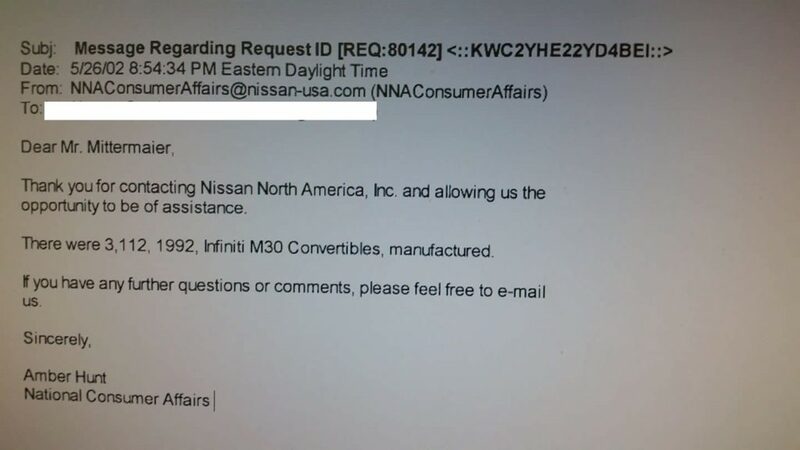 I decided to email Nissan corp. Just to see if they can give me anything. As I said in the forums, the further away we get from 1992, the more information will be lost. It is an obscure car and obsolete to Infiniti/Nissan. Even parts have been discontinued. The search continues… hopefully someone out there has more information to contribute. This entry was posted in blog, history, opinion, parts and tagged #f31club, asc, convertible, infiniti, infiniti m30, m30. My ’92 M30 convertible was manufactured in 11/91, making it one of the last ’92’s made and the ASC number on the sticker says “932”…. so maybe it was the 932nd convertible made for the ’92 production run at the ASC plant. One of the convertible guys said that the number doesn’t reflect how many M30s were convertibles… I do wonder what that number stands for! according to the other page there were 3749 M30 vehicles made in 1992 total. If that is so then it is very unlikely that almost all of them were convertibles. That said one of the two is wrong. I wouldn’t be surprised if the letter was the total of the vehicles made that year total (convertibles and coupes). That would make both wrong but the 3112 is close to the 3749 and it seems more likely that if the 3749 was supposed to be the complete number of M30s produced the other number (3112) was the total amount of vehicles and not just the convertibles. Also that number would be towards the high end for the production ability of ASC at the time with it’s other projects. Thank you for a post reply! Only some of us that want to know are interested in these irrelevant numbers LOL. The 3749 number on that chart was a sales chart. That chart can’t be found on the original site it was taken from. The only evidence, based on that chart, was the sales after 1992. The truth is, it would super cool to get more information (if you read the other posts, I tried to get the numbers). Again, when Alan sent that email, it was already a long time after the M30 ended production and when I asked, they didn’t even know. A few of us have called ASC and tried to find if they had numbers.. and since it was when ASC was pretty much a different country, nobody there knows. All this speculation and detective work is/was interesting for us enthusiasts.